This drawing (around 1845) by John Williams shows a European male, thought to be the Jewish trader Joel Polack, facing three Māori. One has a basket of potatoes at his feet, the second has potatoes on his back and the third is holding a pig. 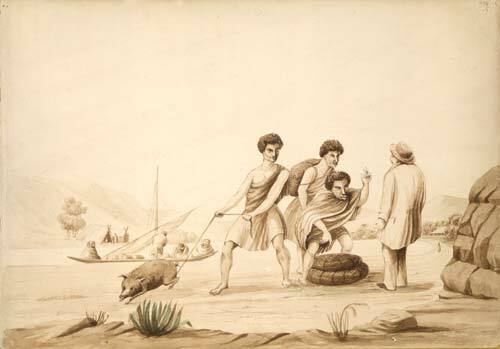 Potatoes and pigs were a major item of trade as Māori responded quickly to the opportunities offered by the arrival of the Europeans.